Exclusive: phones were monitored and fake internet cafes set up to gather information from allies in London in 2009. There have often been rumours of this kind of espionage at international conferences, but it is highly unusual for hard evidence to confirm it and spell out the detail. The evidence is contained in documents – classified as top secret – which were uncovered by the NSA whistleblower Edward Snowden and seen by the Guardian. They reveal that during G20 meetings in April and September 2009 GCHQ used what one document calls “ground-breaking intelligence capabilities” to intercept the communications of visiting delegations. • Receiving reports from an NSA attempt to eavesdrop on the Russian leader, Dmitry Medvedev, as his phone calls passed through satellite links to Moscow. A briefing paper dated 20 January 2009 records advice given by GCHQ officials to their director, Sir Iain Lobban, who was planning to meet the then foreign secretary, David Miliband. The officials summarised Brown’s aims for the meeting of G20 heads of state due to begin on 2 April, which was attempting to deal with the economic aftermath of the 2008 banking crisis. The briefing paper added: “The GCHQ intent is to ensure that intelligence relevant to HMG’s desired outcomes for its presidency of the G20 reaches customers at the right time and in a form which allows them to make full use of it.” Two documents explicitly refer to the intelligence product being passed to “ministers”. One of the GCHQ documents. 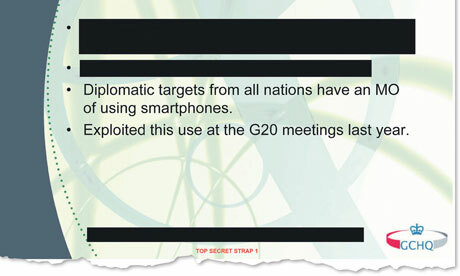 Photograph: GuardianAccording to the material seen by the Guardian, GCHQ generated this product by attacking both the computers and the telephones of delegates. 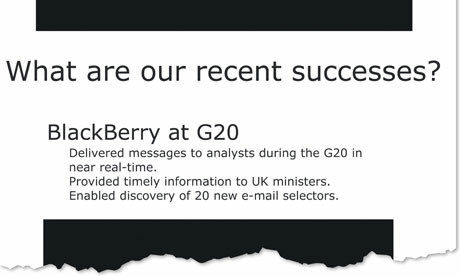 One document refers to a tactic which was “used a lot in recent UK conference, eg G20”. The tactic, which is identified by an internal codeword which the Guardian is not revealing, is defined in an internal glossary as “active collection against an email account that acquires mail messages without removing them from the remote server”. A PowerPoint slide explains that this means “reading people’s email before/as they do”. The same document also refers to GCHQ, MI6 and others setting up internet cafes which “were able to extract key logging info, providing creds for delegates, meaning we have sustained intelligence options against them even after conference has finished”. This appears to be a reference to acquiring delegates’ online login details. Another excerpt from the GCHQ documents. Photograph: GuardianA detailed report records the efforts of the NSA’s intercept specialists at Menwith Hill in North Yorkshire to target and decode encrypted phone calls from London to Moscow which were made by the Russian president, Dmitry Medvedev, and other Russian delegates. Another document records that when G20 finance ministers met in London in September, GCHQ again took advantage of the occasion to spy on delegates, identifying the Turkish finance minister, Mehmet Simsek, as a target and listing 15 other junior ministers and officials in his delegation as “possible targets”. As with the other G20 spying, there is no suggestion that Simsek and his party were involved in any kind of criminal offence. The document explicitly records a political objective – “to establish Turkey’s position on agreements from the April London summit” and their “willingness (or not) to co-operate with the rest of the G20 nations”. The September meeting of finance ministers was also the subject of a new technique to provide a live report on any telephone call made by delegates and to display all of the activity on a graphic which was projected on to the 15-sq-metre video wall of GCHQ’s operations centre as well as on to the screens of 45 specialist analysts who were monitoring the delegates. “For the first time, analysts had a live picture of who was talking to who that updated constantly and automatically,” according to an internal review.